The land on which Harwich stands was created in the 11th century when the Gulf Stream altered its course and the Rivers Orwell and Stour changed their paths. 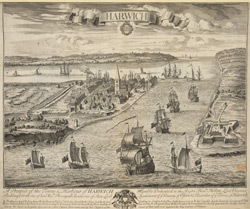 The town at Harwich was granted a Royal Charter by Edward II in 1318. Harwich developed around the busy and thriving port. Landguard Fort can be seen to the right of the print- labelled ‘G’. A fort was originally built on the Landguard Peninsula at the command of Henry VIII for the defence of the entrance to the harbour. This fort was rebuilt a number of times in the 18th and 19th centuries when new developments in arms and ammunitions were implemented and the defences were improved. The key below the engraving, also identifies other well known buildings such as the Lighthouse, and Shortley Church.